Michael Boyle, the author of this brief bio, has been turning for an estimated 18-20 years. Note, at my age, memory is one of the first three things to go. I don’t remember what the other two are. 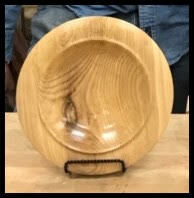 I have been a member of the Dallas Area Woodturners (DAW) for at least 8 years and possibly more (memory once again). I have taken a few classes with Jimmy Clewes, Alan Lacer, David Ellsworth, Rudy Lopez and other local turners over the years and learned valuable design, sharpening and tool handling techniques which I have found very helpful to my turning prowess. I taught group turning classes at the Rockler Woodworking and Hardware for a few years in Richardson, TX. I now I teach individual lessons on request at my home shop in Allen, TX, and scheduled group lessons at the Woodcraft store in Plano, TX. My wife, Sue, and I both turn and currently have four lathes. Our biggest is a Vicmarc VL240 with a bed extension, next in order of size is a Vicmarc VL150, a Jet 1221 EVS and a Jet 1015. My wife and I both enjoy turning and sharing our turning abilities with others interested in improving their turning skills.